Amazon.com description: Product Description: A love story of modern Poland, by the author of Quo Vadis. The scene is laid at Kieff, and university life there is described. 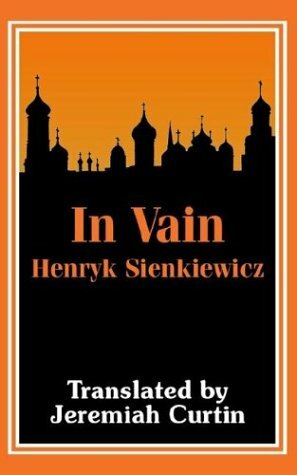 In Vain the first literary work of Sienkiewicz, was written before he had passed the eighteenth year of his life and while he was studying at Warsaw. This volume contains pictures of student life drawn by a student who saw the life which he describes in this work. His student was a person of exceptional power and exceptional qualities, hence the value of that which he gives us. Henryk Sienkiewicz (1846-1916) was a novelist, born in Poland. He studied at Warsaw, traveled in the USA, and in the 1870s began to write articles, short stories, and novels. His major work was a war trilogy about 17th-century Poland, but his most widely known book is the story of Rome under Nero, Quo Vadis? (1896), several times filmed. He received the Nobel Prize for Literature in 1905. Jeremiah Curtin (1835 - 1906) translated this authorized, unabridged edition from the Polish. He was a renowned folklorist, linguist and translator.